A team of astronomers led by Dr Benjamin McKinley at Curtin University node of the International Centre for Radio Astronomy Research (ICRAR) and the ARC Centre of Excellence for All Sky Astrophysics in 3 Dimensions (ASTRO 3D) observed the Moon with a radio telescope to help search for the faint signal from hydrogen atoms in the infant Universe. Animation of the radio waves from our galaxy, the Milky Way, reflecting off the surface of the Moon and observed by the Murchison Widefield Array radio telescope located in outback Western Australia. Credit: Dr Ben McKinley, Curtin University/ICRAR/ASTRO 3D. Moon image courtesy of NASA/GSFC/Arizona State University. “Before there were stars and galaxies, the Universe was pretty much just hydrogen, floating around in space,” Dr McKinley said. “Since there are no sources of the optical light visible to our eyes, this early stage of the Universe is known as the ‘cosmic dark ages’. In research published in the Oxford University Press Monthly Notices of the Royal Astronomical Society today, the astronomers describe how they have used the Murchison Widefield Array (MWA) radio telescope to help search for radio signals given off by the hydrogen atoms. Dr McKinley said that in your car radio, you can tune into various channels and the radio waves are converted into sounds. “The radio telescope, the Murchison Widefield Array (MWA) which is located in the Western Australian desert far away from earth-based FM radio stations, takes the radio signals from space and which we can then convert into images of the sky,” he said. 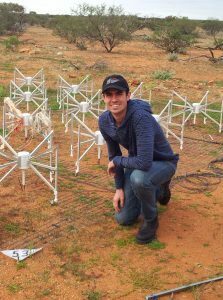 Dr Benjamin McKinley during a trip to the Murchison Widefield Array telescope in outback Western Australia. The 16 metal ‘spiders’ form a single antenna ‘tile’, of which there are 256, spread out across an area of around 6 km in diameter. Dr McKinley and the team are using this radio telescope to observe the Moon in their search for radio signals from the early Universe. This radio signal from the early Universe is very weak compared to the extremely bright objects in the foreground, which include accreting black holes in other galaxies and electrons in our own Milky Way. The key to solving this problem is being able to precisely measure the average brightness of the sky. However, built-in effects from the instruments and radio frequency interference make it difficult to get accurate observations of this very faint radio signal. In this work, the astronomers used the Moon as a reference point of known brightness and shape. This allowed the team to measure the brightness of the Milky Way at the position of the occulting Moon. The astronomers also took into account ‘earthshine’—radio waves from Earth that reflect off the Moon and back onto the telescope. Earthshine corrupts the signal from the Moon and the team had to remove this contamination from their analysis. With more observations, the astronomers hope to uncover the hydrogen signal and put theoretical models of the Universe to the test.